Bligh Waters ©Lill HaugenThe Commanding Officer of the Bounty, William Bligh is today considered, by the Fijians at least, the principal European discoverer of Fiji. The Commanding Officer of the Bounty, William Bligh is today considered, by the Fijians at least, the principal European discoverer of Fiji. Bligh Water, a sea area that separates Fiji’s two main Islands of Vanua Levu & Viti Levu is named in his honour. After the famous mutiny on the Bounty, Bligh and his 18 loyalists set sail on a seven-meter open vessel. During this voyage the men in the Bounty’s launch were noted as being the first Europeans to sail through the Fiji Islands or, had Bligh had his way, the islands would now be known as the ‘Bligh Islands’. It was here that ‘wild, cannibalistic’ Fijians in two fast sailing canoes pursued Bligh and his men. Bligh ordered his men to sail into a squall, knowing the canoes would not follow, thus enabling them to escape. Even under such difficult circumstances Bligh still managed to mark all the islands, so well in fact, that his findings are still used for navigation today. During Bligh’s previous trips sailing under Captain Cook, he had duly noted that the natives could be a little hostile and dared not set foot on land. If only he’d known of the enthusiastic and heartfelt welcome that is typical in Fiji today, who knows perhaps he would have stayed a while to discover the stunning scenery that lay below his typical blue horizon. 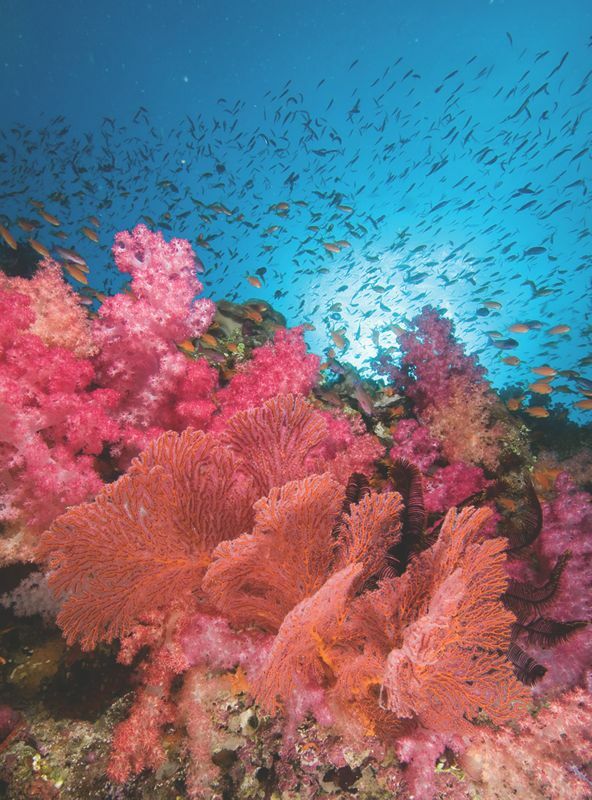 The Bligh Water reef system is one of the reasons Fiji is known throughout the scuba diving community as the soft coral capital of the world. An amazing amalgamation of color – the abundance of ‘Dendronephytha’ in all the colors of the rainbow is truly mind blowing. 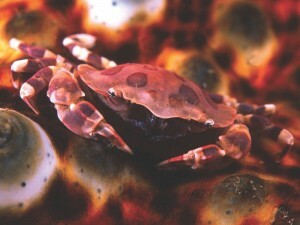 The terrain encompasses a complex web of barrier reefs surrounding large lagoons and islands. The Bligh Water is a shallow marine area that acts as a large bottleneck between the two main islands. With the vast Pacific Ocean currents bringing upwelling and nutrients, it creates the perfect coral habitat. Soft corals are only symbolic of Fiji’s complete story: the soft corals’ vibrant colours and giant size; the massive clouds of fish and clusters of invertebrates that live among their branches; the dramatic changes they undergo in an ancient rhythm of survival with the tides and currents; and the many types of underwater environments in which they thrive. 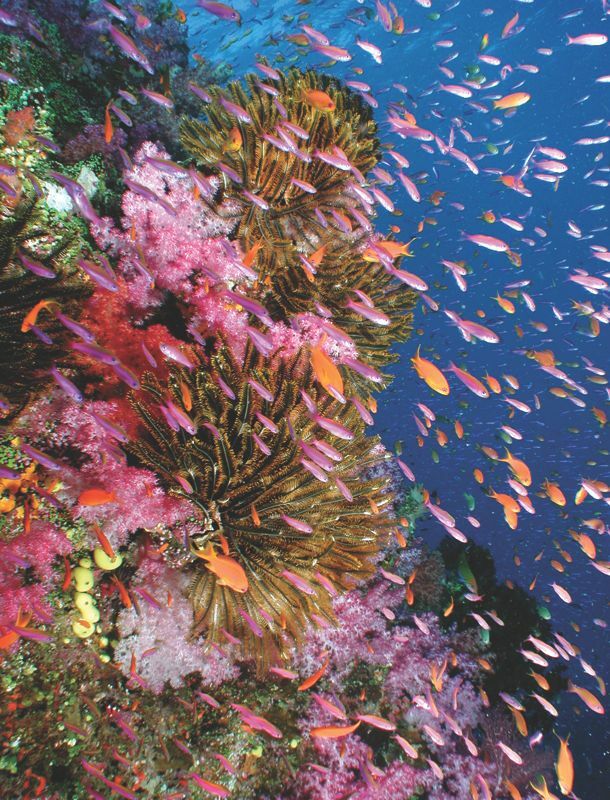 Yes, Fiji’s remarkable soft corals embody all the elements that make Fiji’s reefs so exceptional. 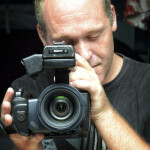 Drama and diversity, brilliant lavish panoramas, deep-water rich with food and shelter for the mysterious and rare. 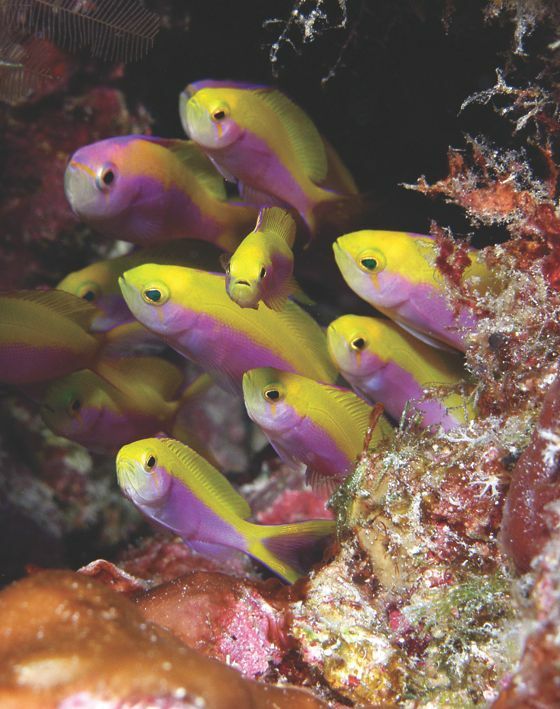 Fiji’s marine realm is as splendid and unpredictable as nature can be. But to dive Fiji is to indulge in much more than the planet’s prettiest soft coral and reef fish scenery. The nation’s 300 plus islands and atolls are entwined in a complex system of barrier reefs so vast that an entire lifetime would not be enough to see them all. With about 1000 species of fish, several hundred types of corals and sponges, an infinite array of crustaceans, molluscs, anemones, – plus new animals still being discovered by divers and described by scientists the shallow coral garden and the deep sloping shelf can reveal something different on every single dive. But look away from the reef into the endless blue to encounter creatures of such size, grace and power as to take your breath away. 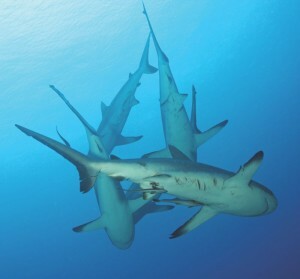 Divers in Fiji commonly meet grey reef sharks and silvertips patrolling walls and congregating in reef passages. Hammerhead sharks cruise near seamounts and pinnacles. 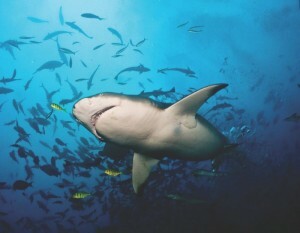 White tip reefs sharks, guitar sharks and leopard sharks are often found sleeping on sand or inside caves. Black tips scurry curiously along lagoon shores and even giant whale sharks are sometimes sighted feeding on the plankton and spawn from the coral reef. Fiji is home to several pods of spinner dolphins and throughout the year migratory whales also visit Fiji waters. Large pods of pilot whales travel through deep channels accompanied by bottlenose dolphins. Humpback whales migrate here from Antarctica to mate and give birth. Orca, minke and sperm whales have passed through for centuries. Manta rays hover over reef-top cleaning stations or somersault in currents to feed. Barracuda swirl into sunbeams and trevally school tightly to guard against predators. Tangs and butterflyfish swarm at the mouth of channels where tuna squadrons compete with giant grouper as chief sentinels. Turtles, nest upon sand cays and graze on reef plants. Everything has its place and Fiji underwater is a place that has some of everything. 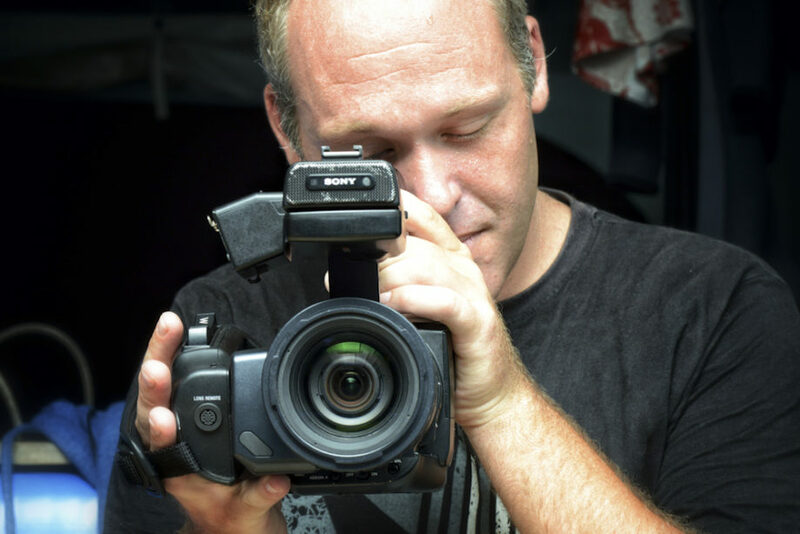 Fiji has kept pace with the latest developments in diving technology and many operators offer the training for and use of Nitrox and Rebreathers as an alternative to air and SCUBA tanks. Fiji’s natural variety extends to practicalities. Some sites, with their sheer deep walls and wild currents, are purely for the adventurous or experienced. 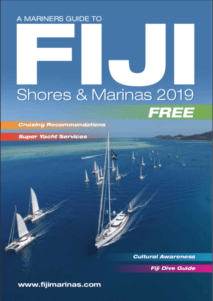 Although Fiji boasts many resorts on both the main islands and many of the outlying destinations, there are also several premier live-aboard diving vessels that are capable of reaching the furthest virgin territories of Fiji and exploring offshore reef systems and distant islands. For you, our visiting yachtsmen and women, our reefs are your oyster, as it were. Being the architects of your own adventure, able to move freely and independently wherever the mood and winds take you; you are in the enviable situation of getting to explore some of the most pristine untouched reefs of Fiji! 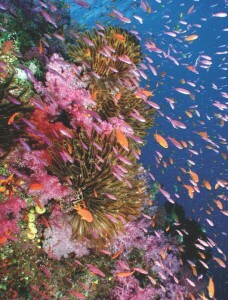 While some such reefs, such as those in the Yasawas are relatively straight forward to find and easy to dive, others such as the Namena Marine Reserve and the Nigali passage are current and tide dependent and therefore, if you wish to see these reefs at their best, local knowledge for these dive areas is imperative. Some of the most mind-blowing reefs are kept a closely guarded secret by those dive enthusiasts that revel in the untouched underwater world. Luckily, some of these fanatics are keen to share knowledge of such places, and can even jump onboard to be your local dive guide, certify you to the next level, video your experience, or take rookies on an introductory dive to erm…quite literally, test the water. 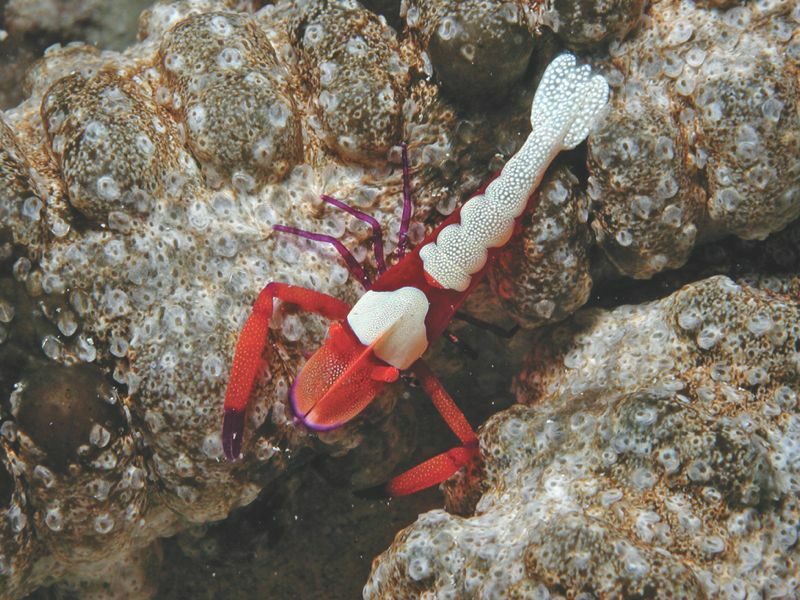 Just imagine being one of the few people to dive on a reef that even local fishermen cannot easily find, abundant with many wild and wonderful ocean creatures and perhaps the odd new species waiting to be discovered! The behaviour of the fish on these reefs is remarkably different; inquisitive grouper swim right by as if to ask ‘what the heck are you?’, usually skittish turtles continue grazing on delicious sponges, oblivious to your presence and if you pause for a moment, a cleaner wrasse may start cleaning your fins assuming you are one of their usual customers. The experience is unreal.